This article highlights the available workarounds and resolution methods to deal with screen mirroring problem on the Samsung Galaxy S4. Read on to learn more. Having trouble connecting to Samsung Smart TV using the screen mirroring feature on Samsung Galaxy S4 smartphone. Screen mirroring issues on the Galaxy S4 are often tied to a temporary issue occurring on the device or an outdated firmware or device software requires an update. While other cases are caused by the Samsung Smart TV not supporting the screen mirroring feature on the mobile device. What to should be done? Before you start troubleshooting the problem, be sure to perform the follow methods first. 1. Perform a soft reset or reboot your mobile phone. This can be done by removing the battery with the phone still on for at least 30 seconds. After the specified period of time, replace the battery and then turn the phone back phone. Doing so will refresh the phone system. 2. Looking at the possibility that the problem is caused by an outdated firmware or device software, be sure to check for any available software update for your phone at Samsung website. You may need to go for a software upgrade this time. If the problem persists after performing the aforesaid processes, then you may now proceed with the following troubleshooting steps or workarounds. 1. Get your Smart TV's remote and press the INPUT button. 2. Select Screen Mirroring to continue. 4. 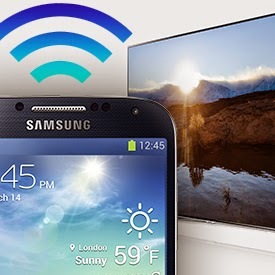 You will then see a list of Smart devices available to connect to your Galaxy S4 for screen mirroring. Choose your Smart TV from the list. 5. Both devices should now be connected and your screen will then be shared automatically. An indication of a successful connection between the device is an icon represented by a screen/monitor with a small circle that prompts at the top of the mobile device's screen, in the notifications area. If problem persists after doing the above specified workarounds, then you may have to do a factory data reset on your mobile device to get this problem solved. Often times, a Factory Data Reset resolves various mobile problems, including screen mirroring issues on the Galaxy S4. However, doing so will delete or erase all of your personalized contents/settings on your device. In this regard, we suggest you should back up all your necessary files first before you proceed with a factory data reset.